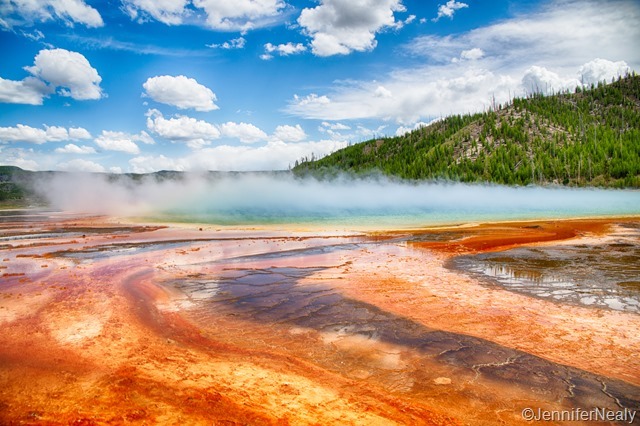 Yellowstone – Geysers, Tours, and Bears! 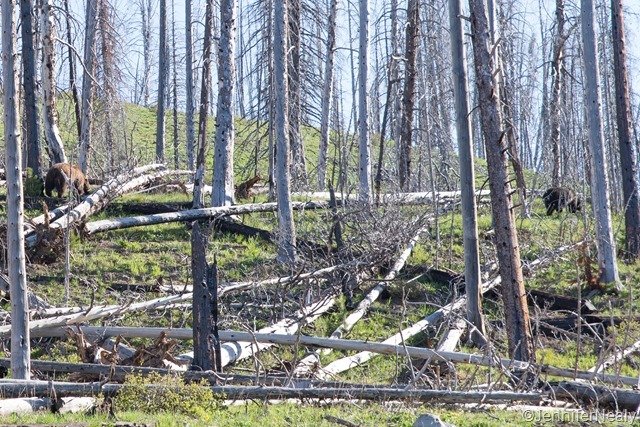 After leaving Grand Teton, we headed straight for Yellowstone. One of the first things we noticed on entering the park was how much snow was still on the ground as compared to Grand Teton! A few of the lakes, such as Sylvan Lake below, were still completely frozen over. We had a 5-night reservation at the Bridge Bay campground. Despite the good reviews on this park, we weren’t overly pleased with it. There are no trees, and so you’re just in a sea of RVs and tents. And it was very, very muddy. We had an awful time trying to walk the dogs in the mucky mess. Granted it really wasn’t the parks fault – I think the snow had just melted a few weeks ago. But it just didn’t make for a very pleasant stay. After our 5 nights, we moved just down the road to Fishing Bridge for 4 nights. It’s the only full hook-up campsite in the park, and it was nice to not worry about water for a few days. The sites are pretty close together, but there are lots of trees between the rows, and it was very quiet. While we were at Bridge Bay, our friends Don and Gail were staying at Fishing Bridge. We met them last year in Oregon, and have met up with them a couple of times since then and it was fun to see them again. Don and Gail RV half of the year and do some camp hosting, and they just started a great blog – Wine Coasters Blog. I love that name! Check their blog out if you have some time. 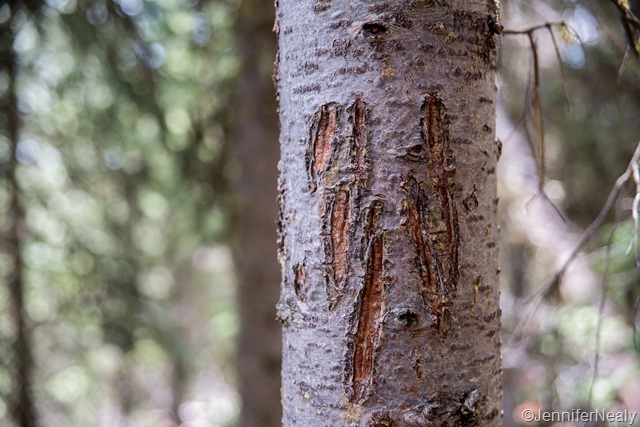 The ranger walk was in the canyon area, and we saw some interesting things, like grizzy bear marks on trees! 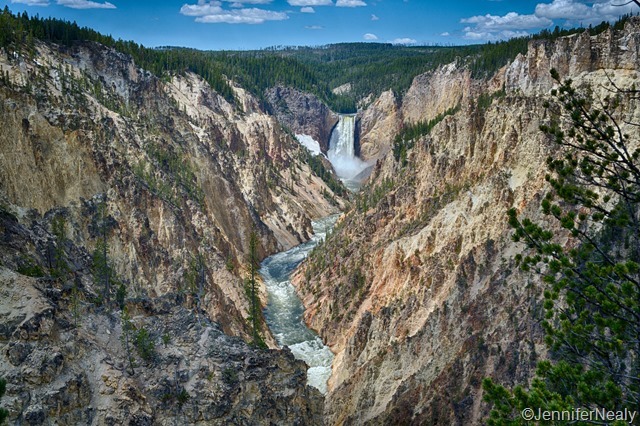 And some lovely views of the Grand Canyon of Yellowstone and the Lower Falls. We walked along a trail that took us to a place called Artist’s Point, which has a amazing view down the canyon back towards the falls. 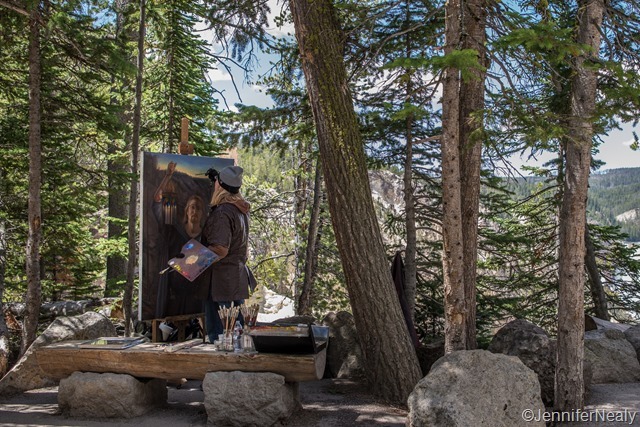 And we even saw an actual artist there, painting a self-portrait! 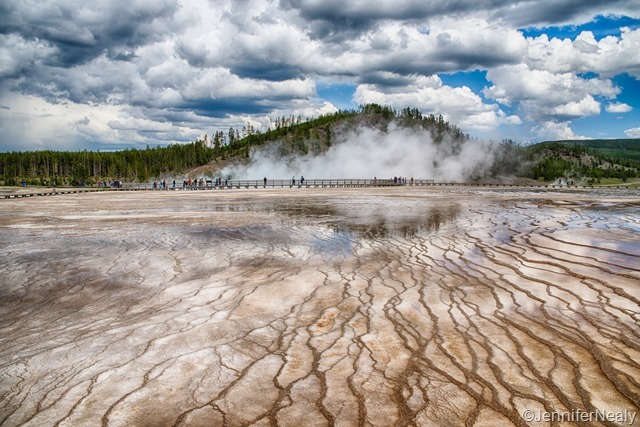 Deas and I did lots and lots of driving around – Yellowstone in huge! 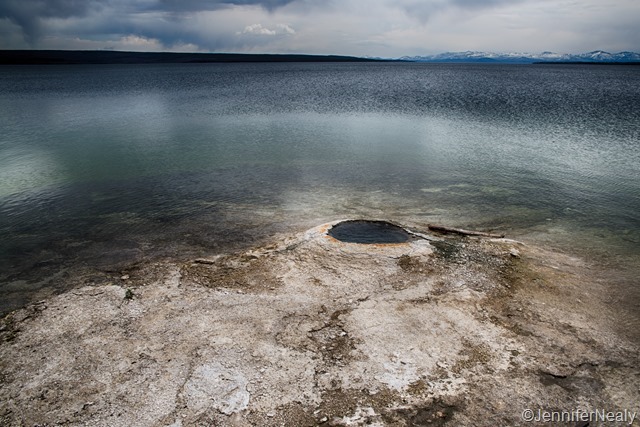 One afternoon we visited the West Thumb Geyser Basin, which is one of the smaller geyser basins, but it’s location right on Yellowstone Lake makes it one of the most scenic. Years ago, there was a lodge and other visitor services in West Thumb, but once the park realized the damage that was being done to the fragile ground in the area, the hotel and other buildings were torn down. One of the more interesting things at West Thumb is the feature knows as Fishing Cone. 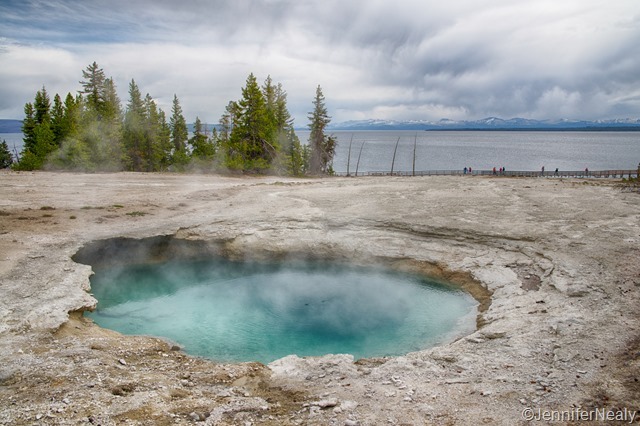 This is a geyser that is located just off the shore. 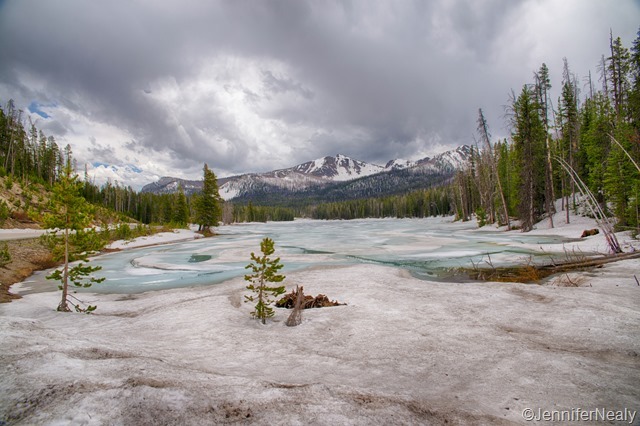 Normally it’s above water, but the lake level was very high the day we visited due to all of the snow melt. Due to the high temperatures inside Fishing Cone, fishermen would catch their fish, dunk it into fishing cone, and it would be immediately cooked. People were allowed to fish in the lake and use Fishing Cone until it was banned in 1912, when one irresponsible person kicked in one of the sides of the cone. Don and Gail told me about a paid photo excursion that they had done and enjoyed, so I signed up for that as well. 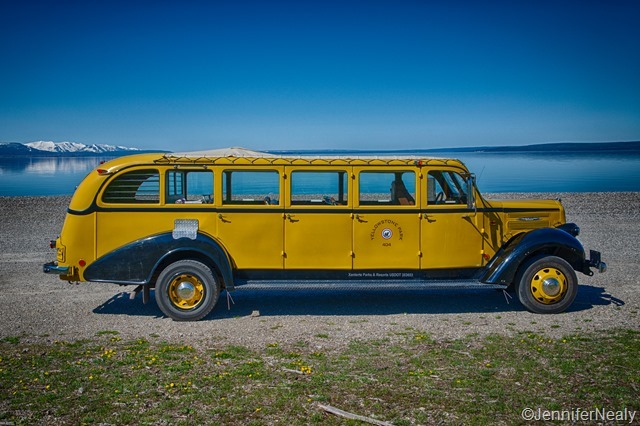 One of most fun things about it was we got to ride on one of the old Yellowstone buses! 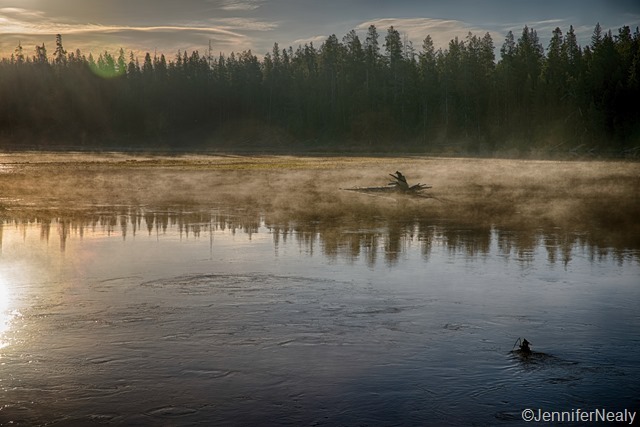 We headed out early in the morning, both to take advantage of the early morning light, and to hopefully see some wildlife. 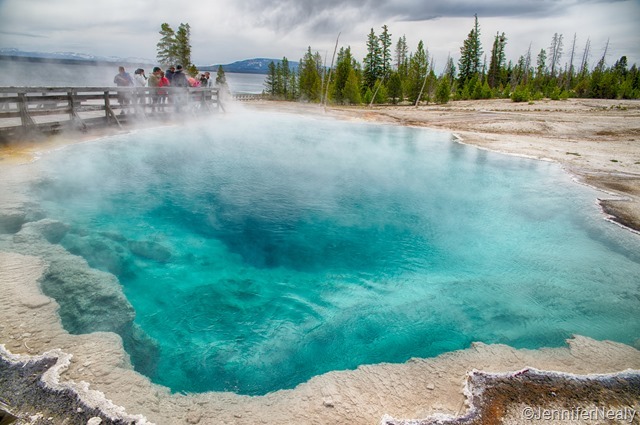 There are two of these tours every day – the one I went on leaves from the Lake Hotel (near Fishing Bridge), and the other one departs from Old Faithful. We headed east from the Lake Hotel, and one of our first stops was Pelican Creek. It’s more of a lake right now due to the snow melt off. Our guide, Lisa, said that in just a couple of weeks this water will recede drastically. Lisa told us before she left that she of course could not guarantee any wildlife sightings, but told us to keep our eyes peeled as we drove down the road. I was sitting in the back of the bus and wasn’t too optimistic that we would see anything, but kept my eyes focused in the trees just in case. And all of a sudden, I saw a bear! I yelled out to Lisa and she quickly pulled over. 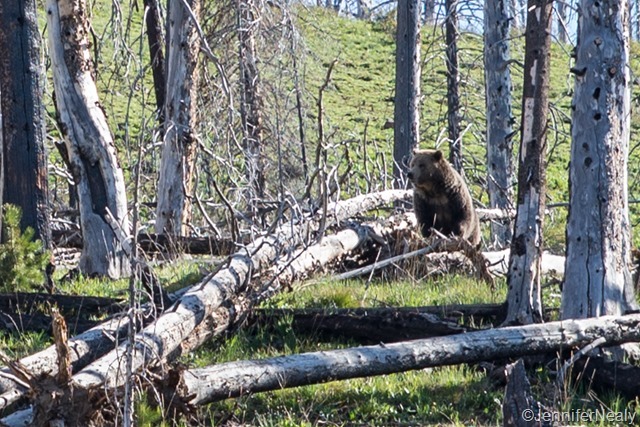 We caught a small glimpse of a grizzly bear wandering from a clearing into the woods. We waited for about 10 minutes, but he never reappeared. So we turned around and headed back the other way, thinking maybe he’d reappear on the other side of the woods. 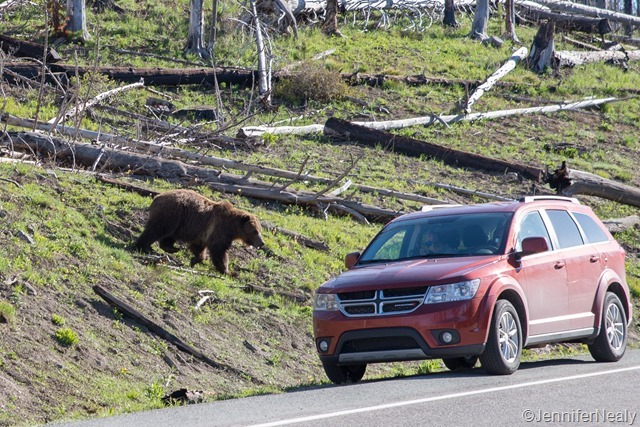 About 5 minutes later, Lisa spotted another bear, this time on the other side of the road! 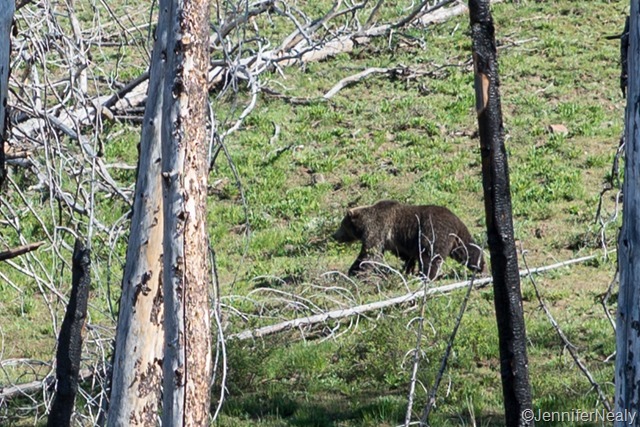 And as we were all watching with our binoculars, we quickly realized there were actually two adult bears! Lisa suspected it was a male/female mating pair as they both appeared to be adults. This was the only picture I was able to get with both bears in the shot. But I was able to get some decent pictures of them individually. 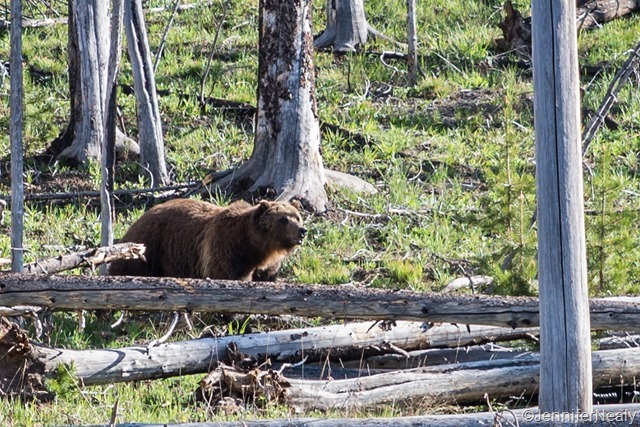 Unlike the mama bear we saw in Grand Teton, these bears seemed very agitated. They seemed to want to cross the road, but by this time there were about 10 other cars that had stopped, some of which were blocking their path. They were pacing back and forth and seemed a little restless. Lisa wisely suggested we get back in the car at this point. 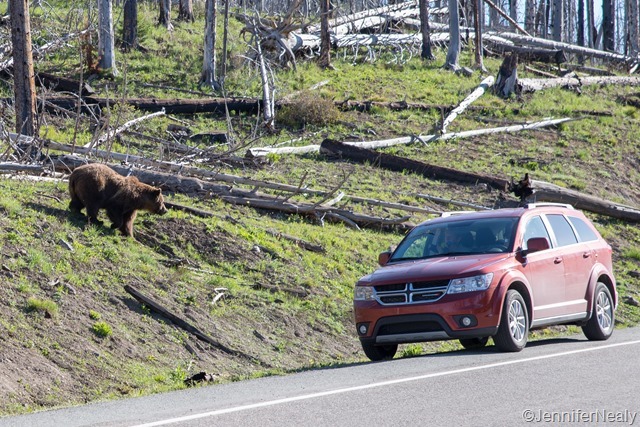 One of the bears did manage to run across the road, and so now all of the people were in between the two bears. The one bear left on the other side of the road didn’t like this at all. He suddenly started running, right at a car. I can’t imagine what these people in the red car were thinking at this moment! 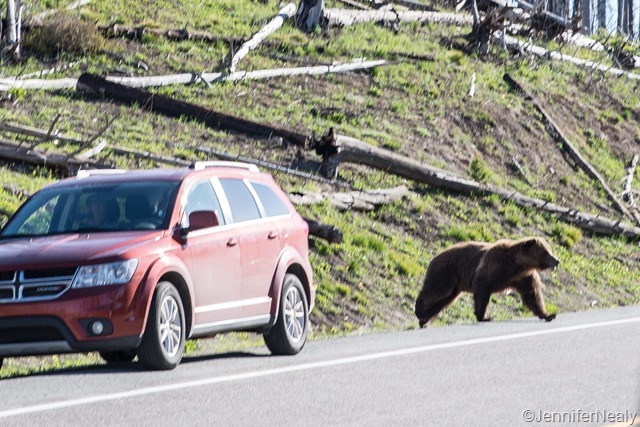 Just when I thought we were going to see a real-life version of “When Animals Attack,” the bear ran right past the car and across the road. With that, the bears disappeared into the wood across the street. We were all commenting on how exciting it was to see 3 bears in one outing, when all of a sudden a fourth one appeared! 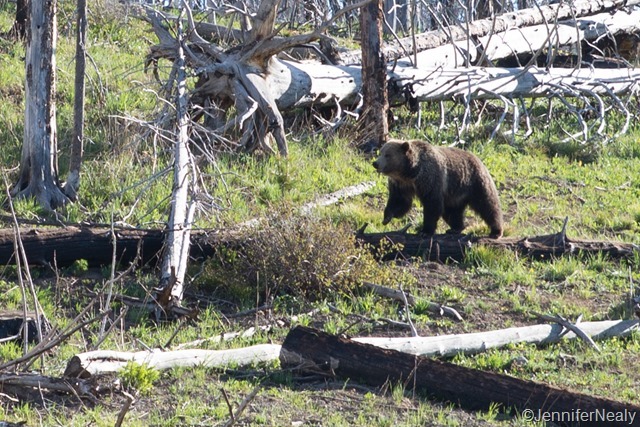 This bear has a distinctive white patch on his side, which you can just barely see in the picture. For some reason I don’t understand, he is known as “Rasberry.” Lisa suspected that he was also in pursuit of the female that we had just seen as he seemed to be following in their path. 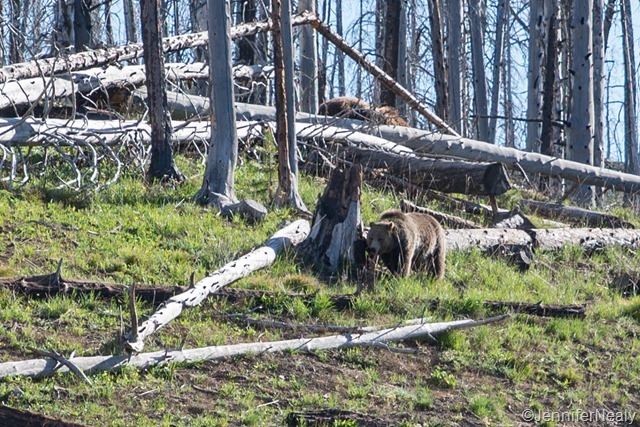 So that brought our grizzly sightings to a total of 4! That night Deas and I drove back to Pelican Creek and watched a beautiful sunset. 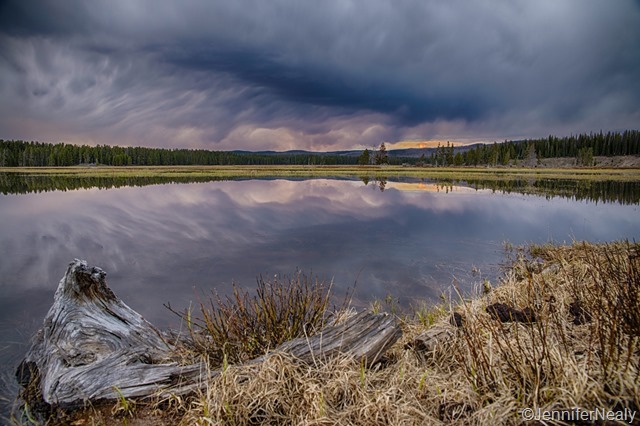 Our first several days in Yellowstone were quite a treat! What amazing shots you got of everything! Calendar material for sure! Thanks for taking us there! Thanks! I just got a new camera and I am LOVING it! These are the first pics I took with it. I had to beg, borrow, and steal to convince Deas to let me buy it but I’m so glad I did! What camera do you have? I’m a little underwhelmed with mine and would love something that I can put a wider angle lens on. Wow…you really managed to capture some stunning shots there. I especially love the last one. Beautiful pics! Thank you! Having a lot of fun with my new camera! Yes I agree with Nina, that last shot is a stunner. What kind of camera did you get? I’ve got my eye on a Canon T3i. Thank you so much! I got the Nikon D610. I’m partial to Nikon but Canon makes great cameras too. My brother-in-law has the T3i and loves it! We definitely saw a lot of wildlife! I’ve got a couple more posts coming – we were there for 17 days so I have a lot to write about! Thanks! I got your message the other day but we were in a bad service area – I’ll give you a call today! Jen and Deas, these are great pictures! Makes me so excited about getting back out West. Take Care. Thank you! When do you head back out? Left my Airstream in Moab. I will pick it up about mid-July and head north. 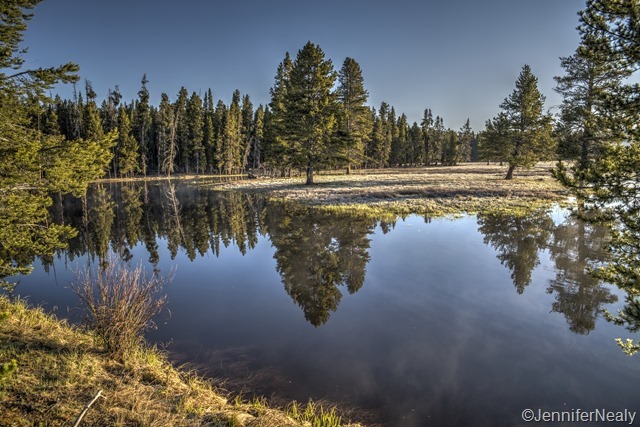 Spend some time in Wyoming, Idaho and then head up to Glacier. What amazing photos! I too love that last shot! 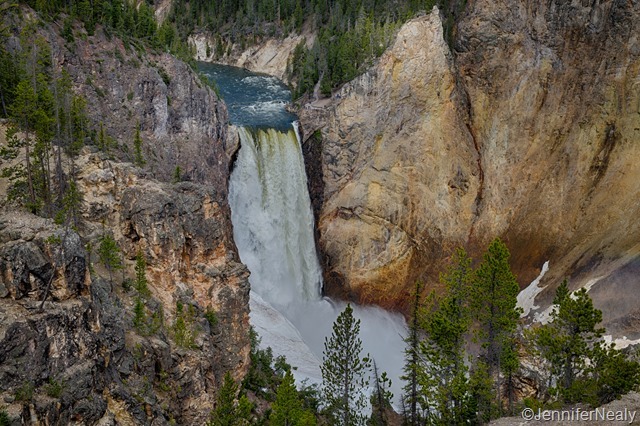 We have missed Yellowstone and your pictures took me right back there. Wow! Such beautiful photos of an amazing place. 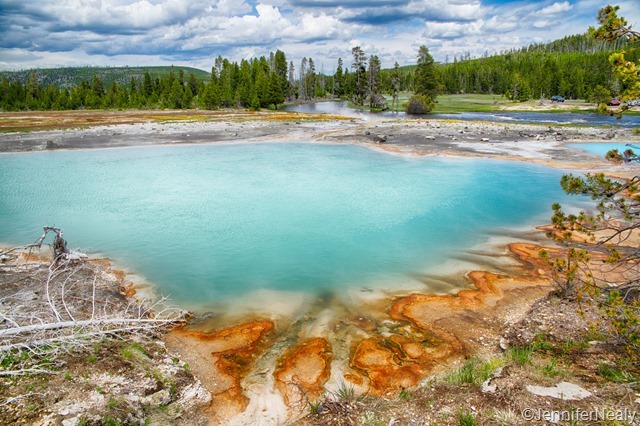 Its been too long since we explored Yellowstone. You captured the beauty perfectly. Thank you very much! It’s a beautiful place with lots beauty available for the capturing. I’m really loving your photos and reading about your experiences. Do you remember the name of the photo tour you did? I don’t remember the name of the tour, but it was just something basic, like”photo safari” or something like that. 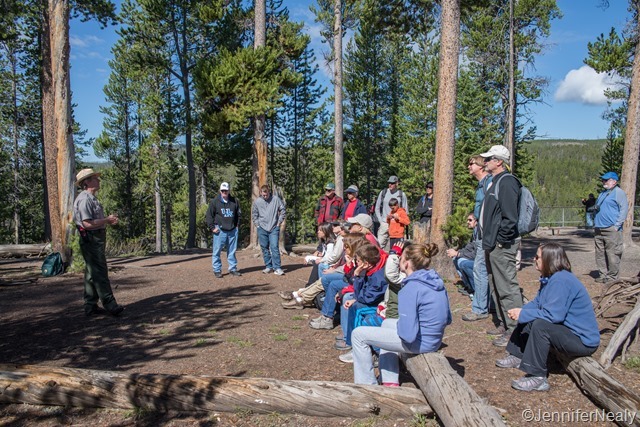 Just go to any of the ranger stations and they can give you a list of all of the ranger-led programs. The one I did started at the Lake Hotel.